No, not more layout designs? Amby Nangeroni ran PoLA on his own and had his hands full. We hosted the 18th Op session on the Aquia Line and 23rd on PoLA today. Eric Payne brought four other folks from his crew with him. They included his dad, George, Lauren Baker, Tim Laswell, and David Betz. Lauren was the first female crew member on the Aquia Line for an official session. We also had the pleasure of visits by Fred Hutchison and his son, Will. Fred is a fraternity brother of mine who is planning a 1:24 scale narrow gauge layout in his garage. This was an experienced crew and they ran the railroad expertly. It was fun to watch them work. I managed the dispatcher's desk and maintained a train sheet for the first time on the Aquia Line. We ran an extra train, so I had to write some train orders. The crews reported OS verbally since the telegraph system is not yet operational. Meanwhile Amby Nageroni worked PoLA. He had his hands full as a one-man crew and wasn't able to finish the job before he had to head home. In the debrief we discussed the various options for expanding the layout. Amby and Eric like the redesign v28d with the long peninsula, While George, Lauren , Tim, Terry, Chase (my son) and Alicia all prefer the Fredericksburg Extension. It's unclear which plan Roux prefers. To compare plans see the Fredericksburg Extension plan here. The alternative, V28d, is shown below. Today we saw a situation where a longer mainline of V28d would make more interesting operation. That is when an inferior train is late. The superior train can leap frog ahead of the time table as long as it maintains a 10 delay. Inferior trains that are late must be especially careful. Resolving this situation would work better, i.e. with more skin in the game, if there were additional stations to jump to. Also, A longer run would also allow more trains on the RR at one time. So running extras would be much easier to accommodate and might be routine. The main drawback of V28d is that we lose the distinct Burnside Wharf switching area. It's a tough call. I'm still undecided. But, I will say that operation sessions like this on the Aquia Line convince me that any option of the Aquia Line is preferable to the other more modern ideas I have considered. I intentionally lined up train 7 with nine cars today and the challenges of working longer trains on the Aquia Line convinced me that I need to build longer sidings to accommodate ten-car trains. TT&TO with ten car trains will make for very interesting op sessions. 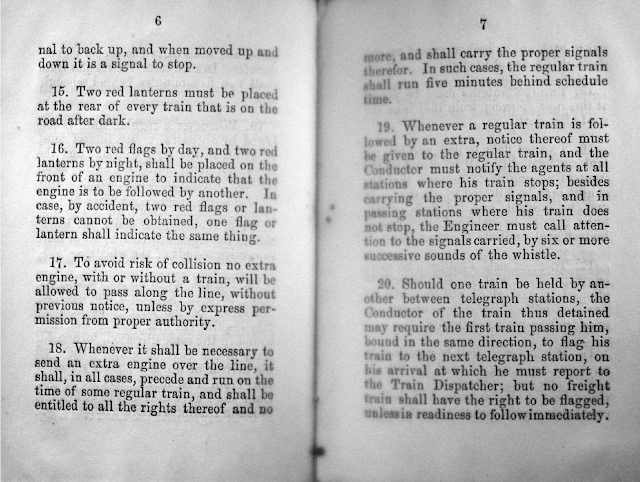 We had some questions today on the signal flags that the trains should use when running an extra. Here is the applicable page from the rule book. These rules are a bit confusing, it's no wonder there were accidents. Typically, when looking at prototype Train Sheets we see that they usually had extra trains follow a scheduled train. That means the scheduled train displays red flags in front, while the extra displays white flags, as long as no other extra is also following that extra. That is what we did today. First time we tried maintaining a train sheet for the session. so crews verbally OS'ed, at least some of the time. On Friday, Terry Terrance stopped by to provide some technical advice on disassembling an O scale Weaver 2-8-0 for conversion to P48. I am doing some experimenting with P48, mostly out of curiosity. I don't expect to build a large P48 layout in the future. 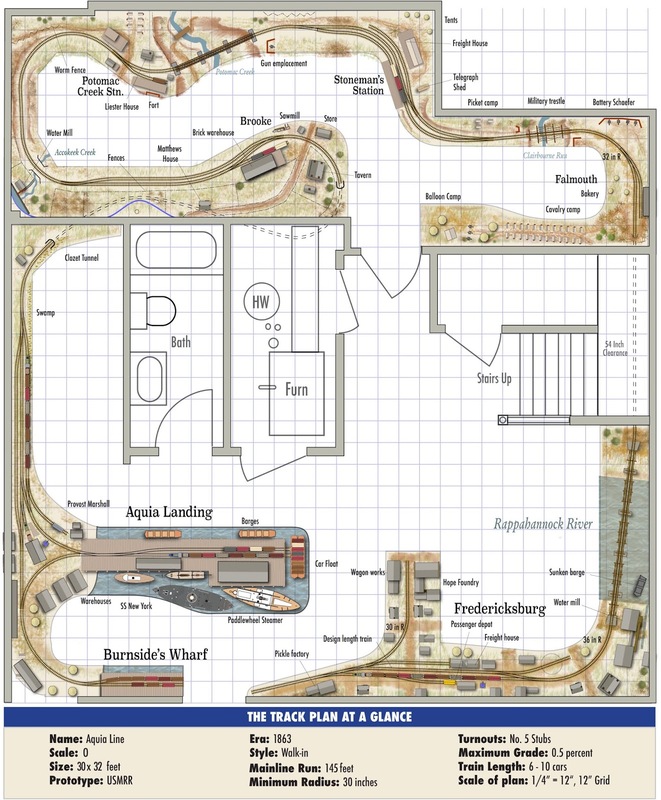 So the choice comes down to 1) expanding the layout in a way that allows more and more variations of the ACW-style TT&TO operation your layout is intended to highlight (Version 28d) vs. 2) expanding the layout in a way that creates more switching opportunities at Burnside Wharf and Fredericksburg (FredEx). The choice seems obvious to me, but go with your gut feeling on this. I'd think Aquia Landing itself and your PoLA layout would satisfy the need for switching. Unless there's something particularly historically significant about Fredericksburg and Burnside Wharf, something that can rival the impact of expanding ACW TT&TO operations and your ability to educate and replicate that, I'd go with Version 28d. 1. Longer, more rural run. 2. 50% more passing opportunities (3 sidings vs. 2). 3. Less switching required = more emphasis on ACW railroad rules. 4. 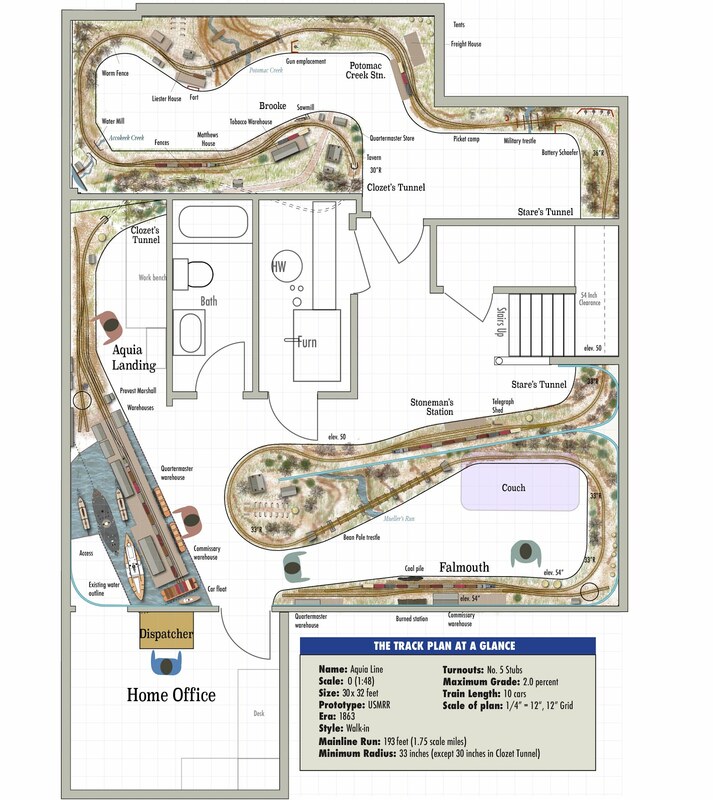 Larger model of Aquia Landing (more emphasis on reason for railroad). 5. Easier to disguise tunnel under stairs. 6. Better model of Falmouth (preserves station order). 1. Large gathering area at bottom of stairs (improved people flow). 2. Wye at Aquia Landing (wyes are cool, especially if prototypical). 3. Anchors both ends of the railroad, both termini modeled. 4. More opportunity for structure modeling (could be a negative!). 5. Rappahannock River bridge (different perspective than crossing ravine). I hope this helps. Either way, your modeling will do it justice! I do have several stools in the various rooms for crews to get off their feet. The crew lounge is used more for times when we are not operating. During op sessions everyone is assigned jobs. There are rarely people waiting to go on duty as it other large RRs. Mmmm interesting 28d, the Landing show some real promise of having a real "wow' factor. All walk in design, looks really comfortable. How about building Falmouth as per this design, but have previsions for the peninsula, operate it without it for awhile, this will give you a true sense of the "dead" space you need to be comfortable to operate. if all goes well you can add the Peninsula later,if you find you do need the space you have not wasted all that time and effort. (maybe at a later date, you could stick another small POLA type layout in the peninsula's spot, make it rollable so it can go under the the landing) I reckon the landing will have the greatest impact if it can be viewed without any distraction from a Peninsula.my two cents worth. keep on blogging! !